The BBC's Middle East Editor, Jeremy Bowen, looks at increasing speculation that Iran may come under attack because of its nuclear programme. Last December American intelligence agencies said they had "high confidence" that in late 2003 Iran had stopped trying to build nuclear weapons. That seemed to end much of the talk about an American - or Israeli - attempt to destroy the facilities that Iran has developed for what it insists is a purely peaceful nuclear programme. Plenty of influential people in the Middle East, Europe and the United States think an attack on Iran would have consequences potentially as disastrous as the invasion of Iraq in 2003. It would also send oil prices, already through the roof, into orbit. But the talk has started again. Negotiations with Iran - and sanctions against it - have not stopped it enriching uranium, which its critics say is being done to make a bomb. In one of his first acts after he secured the Democratic nomination for president of the US, Senator Barack Obama told Aipac, America's most powerful pro-Israel lobby, that he would do everything in his power to prevent Iran from getting a nuclear weapon. He repeated the word "everything" several times. Even allowing for the fact that he was also trying to dispel the impression that he was soft on Iran, it was strong language. The American National Intelligence Estimate that was published in December 2007 was more nuanced than some of the headlines suggested. It had only "moderate confidence" that Tehran had not restarted its nuclear weapons program by the summer of 2007, and said "we do not know whether it currently intends to develop nuclear weapons". Israel, among others, has never accepted that Iran has stopped trying to build them. Ehud Olmert, Israel's prime minister, has been in Washington this week. The day before Senator Obama addressed Aipac, Mr Olmert used some of his toughest public language yet about Iran to the same audience. "The international community has a duty and responsibility to clarify to Iran, through drastic measures, that the repercussions of their continued pursuit of nuclear weapons will be devastating," he said. The speculation is that President George W Bush and Prime Minister Olmert want to remove what they believe is a clear and present danger before they face their own political oblivion. Mr Bush is finishing his time at the White House still dogged by the disaster of Iraq - and Mr Olmert faces disgrace over allegations of corruption. The talk has alarmed, among others, the former German Foreign Minister, Joshka Fischer. Germany has, with the five permanent members of the UN Security Council, taken the lead in talks with Iran about its nuclear plans. He wrote in the Israeli daily Haaretz this week that Messrs Bush and Olmert seem to have been planning to end the Iranian nuclear programme "by military, rather than by diplomatic means". Mr Fischer fears that the Middle East is drifting towards a new great confrontation in 2008. "Iran must understand that without a diplomatic solution in the coming months, a dangerous military conflict is very likely to erupt. It is high time for serious negotiations to begin," he said. One scenario being discussed by Israeli analysts is that there could be an attack, by Israel or by the Americans, after the US election in November and before the new president is inaugurated in January, with the tacit consent of the incoming president. That might be easier if it is Senator Obama's Republican rival John McCain. During the campaign for his party's nomination, he once sang "bomb bomb bomb, bomb bomb Iran" to the tune of the Beachboys' classic Barbara Ann. In a less jocular moment, he said that the only thing worse than attacking Iran would be to allow it to have nuclear weapons. Some pro-Israeli US analysts are arguing that Iran's response to an attack would not be as harsh as many have predicted. This week Iran's Supreme Leader Ali Khamenei repeated that Iran did not want nuclear weapons. 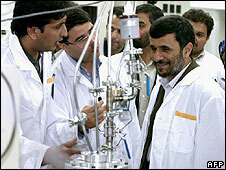 But he said it would continue to develop nuclear energy for daily life. Those who have made their minds up about Iran are more likely to listen to Iran's President Mahmoud Ahmadinejad, who has once again predicted Israel's doom. None of this means an attack on Iran is coming. But it is being discussed, and that is significant.